Comments: The Sentry Robot figure has been considered to be considered part of the second series of Black Hole figures by many, but, for the most part, it is more accurately a part of series 1.5. While there was a second wave of figures including the Humanoid, Old B.O.B. and S.T.A.R., was released in Canada and Italy, MEGO only distributed 9 figures in the US. The Sentry Robot was released late, but US cards for the other eight figures have been shown with either 8 or 9 back cards. This is very similar to the 31/32 back cards in Kenner's Star Wars: The Empire Strikes Back line. 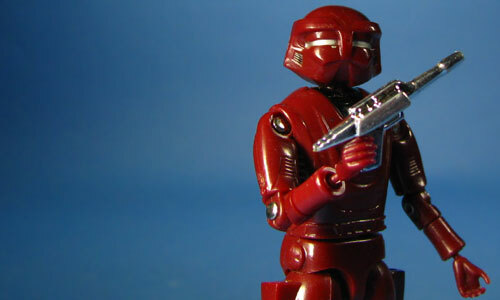 The mould used to create the Sentry Robot figure was reused to create the S.T.A.R. figure. For the most part, minus the colour of plastic injected in the mould and a very minor spray op alteration, both figures are identical. While both figures feature two fuctional holsters, neither were released with two weapons.